Virginia (former Western Maryland). Once a busy company town boasting a pulp mill, two-story hotel and company houses, today Spruce is a ghost town but the tracks still run through the area on a big horseshoe curve. 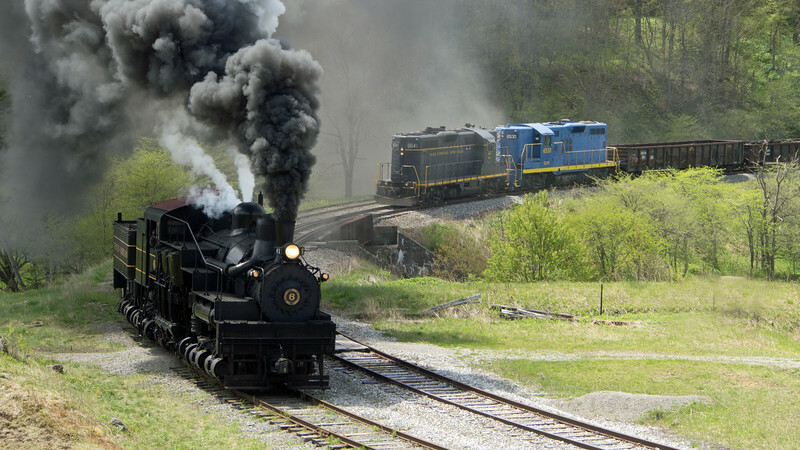 In this view, Western Maryland "Big Six", the largest Shay ever constructed, is on the outside track while coming up from behind is a D&WV freight behind two Geeps, the first in the paint scheme of the "fallen flag" Baltimore & Ohio Railroad. This D&WV line features the highest point reached by mainline rail east of the Mississippi.